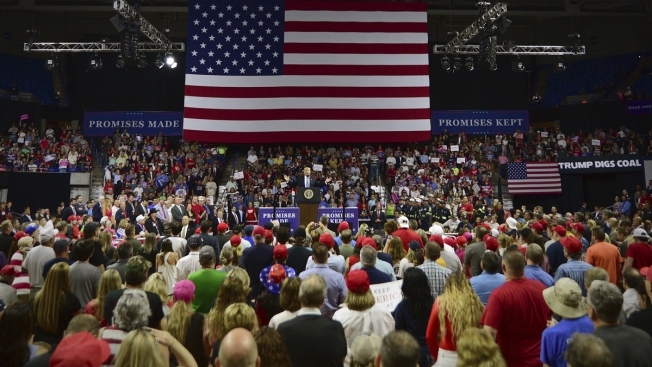 President Donald Trump speaks during a rally Tuesday, Aug. 21, 2018, at the Civic Center in Charleston W.Va.
With the pivotal midterm elections two months away, President Donald Trump's drastic reconfiguration of the political landscape shows no sign of subsiding, NBC News reported. Trump's election and presidency have marked an abrupt and brutal destruction of the political order that's moved Democrats to the left and Republicans toward Trump, with voters increasingly intolerant of anyone who disagrees with them, according to dozens of interviews, an exclusive poll and more. A progressive candidate campaigning in a gay bar in Nebraska for Medicare for All, free college and stricter gun control shows how Democrats are questioning the old rules — after years of compromise, they feel it's better to demand everything they wanted and ask moderates to take a turn giving in. As for Trump, he remains overwhelmingly popular among Republicans even though his standing with the rest of the electorate is underwater. Rep. Tom Cole, R-Okla., said he's changed the party and is its clear leader. "In my last election, I got 70 percent and he got 66 in my district, and if we get into an argument, he'll keep his 66 and I'll keep my 4," he said. And researchers tell NBC News that "negative partisanship," voters basing decisions based on who they loathe more than who they like, is among the trends reshaping politics in 2018.